What's it like to be young and have your whole life behind you? 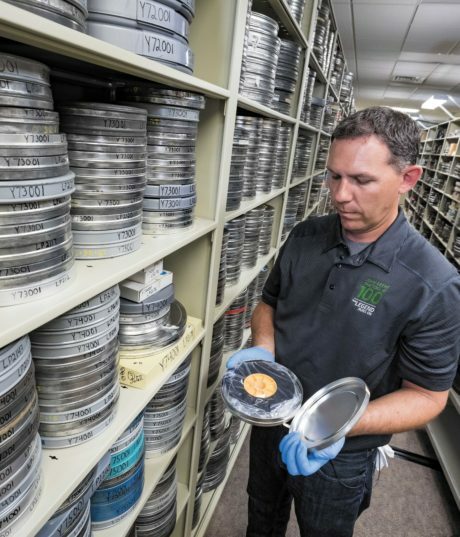 Neil Dahlstrom, manager of the John Deere Archives and History, picks out some of the very best of the Archives' historic films. 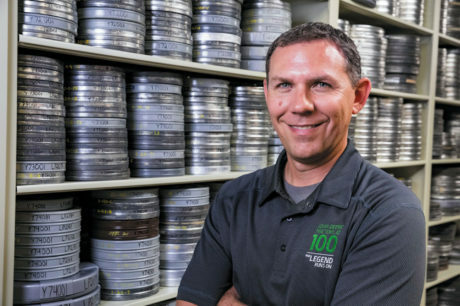 Neil Dahlstrom, Deere & Company manager – Archives and History, stands amidst hundreds of historic films and videos stored in the John Deere Archives. 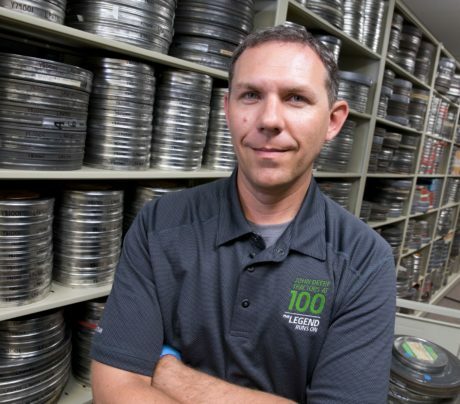 Neil Dahlstrom, Deere & Company manager – Archives and History, is at the top of his game. 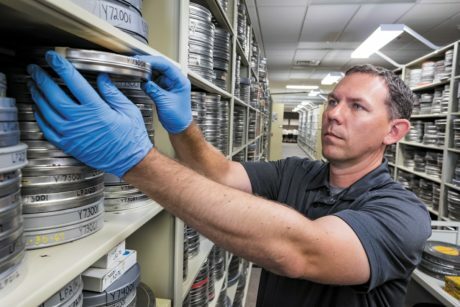 The certified archivist manages a collection totaling several million items for one of America’s iconic companies and is highly regarded in his field. In fact, in August he delivered a joint presentation with the Smithsonian National Museum of American History in Washington, D.C., to a group of business archivists. For Dahlstrom, the road to the summit has been smooth and straight. Or mostly straight. But the early misstep didn’t deter Dahlstrom, who is just a couple years shy of his 20th anniversary with the company. Organizing a company’s history is a Herculean task — millions of items; sometimes unclear provenance and value; and finite resources, but almost infinite demands. It’s a task Dahlstrom seems to have been training for his whole life. 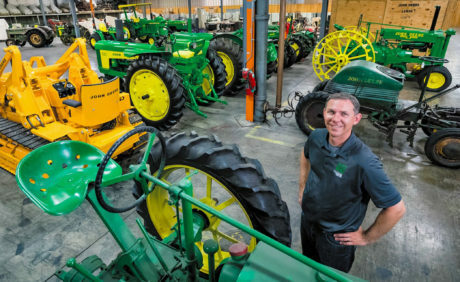 Dahlstrom grew up just a few miles from Deere & Company World Headquarters in East Moline, Illinois, and has loved history since early childhood. For vacations, his family made the three-hour drive to Chicago to visit the Field Museum and the Museum of Science and Industry, and the exhibits fueled his imagination. During high school, Dahlstrom began volunteering in local museums — including the Rock Island Arsenal Museum in Rock Island, Illinois, and the Putnam Museum in Davenport, Iowa — to test whether he might like to pursue studies in museums and archives. He might and did. At Monmouth College in Monmouth, Illinois, he studied history and classics, but a stint in the college archives helped him narrow his focus. At Eastern Illinois University in Charleston, Illinois, he pursued graduate studies in museums, archives, and historical societies. While there, he secured an assistantship with the Illinois State Archives, and that cemented his thoughts on a career. But Deere & Company was still a few miles and a few years away. Dahlstrom’s first job after earning his Master’s degree in historical administration was in Alexandria, Virginia. He was working for a company in the space industry, creating an archive that documented the history of the commercial space industry and private space development. At the time, the space industry was only a few decades old, which made it a strange fit for someone whose main interest was in 19th-century American history. Around the time Dahlstrom began looking for a change, a friend in Moline called to say there was an opening for an archivist at John Deere. Up to that moment, Dahlstrom had been unaware John Deere had an archive and knew little about the company or the man John Deere. But what he found when he took the job in May 2001 was a trove amounting to millions of items — photos, letters, big pieces of equipment, and toy models of big pieces of equipment. The archive had been started in 1976 and managed since 1979 by the same team. One of those was that Dahlstrom was given the freedom to begin applying modern techniques to keeping track of the archive. The Archives houses many rare and historic pieces of John Deere equipment. He taught himself to write HTML, a computer language for creating web pages and applications, and built the archive’s first website. Today, Dahlstrom and his team use three digital catalogs that allow them to deal with requests a lot faster. A request that would have taken eight hours to research 10 years ago might take five minutes today because the records are digitized. The downside is that people’s expectations for finding information have changed. Search tools such as Google have accustomed people to thinking anything can be found almost instantly. But if an item in the Deere archives hasn’t been digitized, the research to locate it can be long and laborious. For example, Dahlstrom estimates the archives have three million photos, only one-tenth of one percent of which have been digitized. The good news is that once a photo or any other item has a digital record, the next search for it will be much easier. But that news isn’t all good because searches tend to be idiosyncratic — people seldom want exactly the same thing. Part of an archivist’s job is to be practical. For example, the John Deere film collection includes about 10,000 hours of footage going back to 1929. Will all of it ever be digitized? Probably not. Dahlstrom admitted it would be nice, but then asked who would watch 10,000 hours of video? Who would transcribe it to make it more searchable? And who is ever going to use more than about a 10-second clip from any of the longer videos? Whereas most people may think archiving is just a matter of putting an item on the shelf, it’s far more complex. First, there’s scope — does an item fall within the archive’s scope? Until recently, John Deere toys were in scope. The problem, Dahlstrom explained, is that the archives has finite storage space. So Dahlstrom decided instead to collect the catalog featuring the toys rather than the toys themselves. Dahlstrom's reflection is captured in a picture frame that houses a wool bathing suite once worn by John Deere. 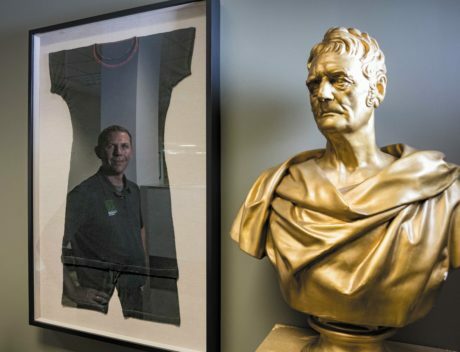 A golden bust of John Deere himself is prominently displayed near the John Deere Archive's entrance. And storage space is just the beginning of the cost to archive an item. Many items have to be appraised and insured. Some items may require an acid-free box or other special storage. Plus there’s the sprinkler system, the electronic shelving, and the electric bill. So putting an item on a shelf may be one step, but it’s the last of about 20 steps, said Dahlstrom. Surprisingly, Dahlstrom doesn’t always know what he’s looking for or even try to know. A professor once told him that the book you need is next to the book you’re looking for. “That’s probably the most important research advice I’ve ever gotten,” said Dahlstrom. He often pulls out a box of records, sits on the floor, and looks through every folder, a habit that proved serendipitous. For the first time, the letters made John Deere seem like a real person to Dahlstrom. His research found that the last book written about John Deere, the man, had come out in the 1940s. Dahlstrom figured that 60 years later there had to be more content available, which is how he became a biographer, writing “The John Deere Story: A Biography of Plowmakers John and Charles Deere” in 2005. Dahlstrom’s book and his work in the Deere archives have earned him a place of honor among his peers. He’s the vice chair of the Society of American Archivists Business Archives Section and spoke recently at the group’s annual meeting at the Smithsonian Institute in Washington, D.C. While in the nation’s capital, Dahlstrom also spent time with fellow archivists lobbying Congress for funds to support grants to archivists around the country to conduct research and training. Later, he discussed John Deere’s 100th anniversary in the tractor business with Dan Neil, the Wall Street Journal’s Pulitzer Prize-winning automotive columnist. Dahlstrom foresees a split between what are known as legacy records — mainly analog items — and digital records. The challenge for archivists is to acquire, appraise, store, and provide access to both types of records. Providing that access to a global company, dealing with many languages, and figuring out what has legal, fiscal, and historical value to the enterprise are challenges Dahlstrom finds rewarding. Learn more about the different employment opportunities at John Deere.